Dr. Seymore Laxon at University College London’s Center for Polar Observation and Modelling stated on BBC News today that Arctic Ice is melting faster than scientists had previously warned. Scientists headed by Laxon analyzed satellite data from the European Space Agency Cryosat to determine sea ice volume trends. They found that since 2004, the Arctic is losing 900 cubic km of sea ice on average each year. By the end of summer 2011, only 7000 cubic kilometers of sea ice remained. These preliminary results showed that, if current melt rates continue, the Arctic could see ice free periods during summer starting in less than 10 years. “We have to be cautious until our data has been properly analysed as part of a climate model, but this does suggest that the Arctic might be ice-free in summer for a day at least by the end of the decade,” Laxon told BBC News. These ice loss rates are troubling for many reasons. First, the rate of loss is more than 50% greater than scientists had previously estimated. Further, loss of large areas of ice coverage reduce albedo (reflectivity). Darker ocean areas absorb more sunlight than white, reflective sea ice. And though many have been callous to the loss of key species in the Arctic, increasing rates of ice loss could drive many species to extinction or unexpected and radical adaptation. 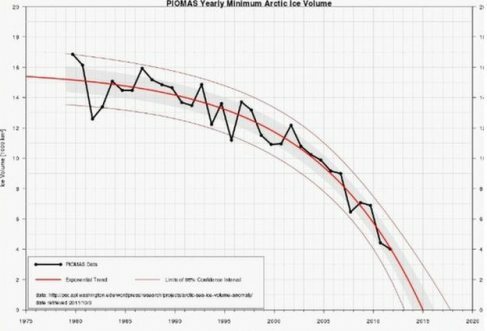 The Polar Science Center has also provided sea ice volume data that shows ice free periods during summer could occur within less than ten years. The statement by Laxon is the first secondary confirmation of this report. Is Climate Change Denial a Threat to US National Security?